The majority of Americans have had zero contact with the 2012 presidential candidates, but are nonetheless tempted to draw conclusions about their private lives based on TV spots and public appearances. We assume we “know” our politicians the way we presume to “know” celebrities, through news appearances or, even more preposterously, through sheer hunches, just feeling like Obama probably likes to gossip over a ciggy, or that Romney is probably less conservative in his heart than the position he presents to the world. The image projected by each candidate is, of course, highly calculated and may not reflect who they really are. "The Choice" attempts to dig past the Oprah interviews and campaign approved messages, corroborating thorough research with interviews with friends, colleagues, professors, and journalists, in order to tease out what makes each man tick. While the exercise is at times stymied by a questionably rigid structure and the fact that much of the information being presented is already a matter of public record, the thoroughness of the investigation does draw some insightful conclusions, from the perspective of psychology rather than politics. Romney, as we all know, was born to filthy rich Mormon parents, the youngest of four children. The shadow of his father, a self-made automotive executive and political hopeful who once ran against Richard Nixon for president, always loomed large over him. After studying at Harvard Business school, he handled takeovers and equity investments for Bain Investments. Apparently, he was so good at making money and turning non-profitable businesses around that one client described working with him as “like being thrashed by the lucky stick.” Soon Romney made forays into politics as a liberal-to-moderate Republican, but his time in Washington made him feel that following his true beliefs made him isolated and ineffectual. Although he had always been socially liberal, a Republican because of a belief in states’ rights rather than an interest upholding the gay marriage ban or making abortion illegal, he has changed his tune for this recent campaign. His history suggests it is the shrewd businessman in him that determined that “the shelf space in the Republican party was on the right,” and altered his platform accordingly. Barack Obama, who went by Barry until fully reclaiming his African heritage while attending college, was born in Hawaii, which the show comically confirms with pointed narration and zooms on his birth certificate. His Kenyan father was out of the picture early on, and his white American mother, just 18 when she had Obama and a bit of a wanderer, briefly moved Barry to live with her new husband in Indonesia before shipping him back to Hawaii, alone, to be looked after by her parents. 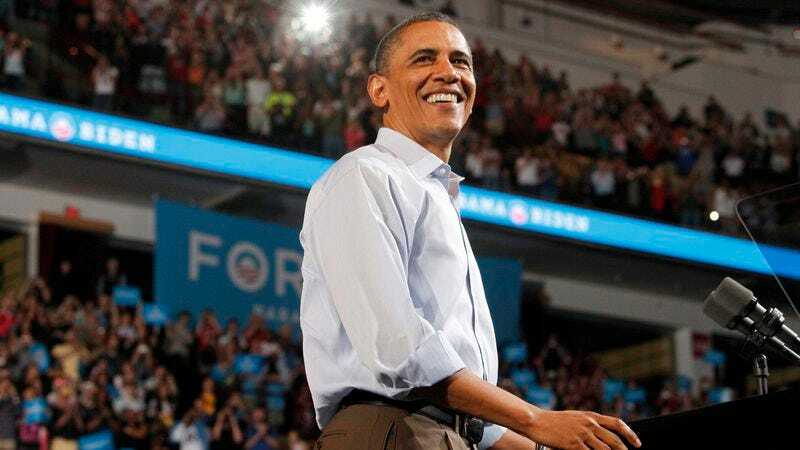 For decades of his life, Obama was plagued by questions of racial identity and his place in the world, a situation that fueled his desire to bring people of various backgrounds together, in life and in politics. Like Romney, however, Obama was disillusioned once he actually took office in Washington after a meteoric rise with his message of hope, in this case because of partisanship that held up his proposed health care reforms. Interestingly enough, the reforms Obama initially suggested were actually based on those Romney made as Governor of Massachusetts. The show explains that this disillusionment, and experiencing the sudden backlash against him, explains Obama’s willingness to up covert operations even while publicly pulling out of the war, and why his current campaign focuses on the difference between the Deomcratic and Republican parties rather than some nonpartisan ideal. The program intercuts these two biographies in order to create vague thematic trends, like each candidate’s childhood in one segment or the life-changing event that propelled them into leadership in another. The first section, for example, introduces each candidate at the time of their first shocking failure, Romney losing to Ted Kennedy in a bid to be Senator of Massachusetts in 1994, and Obama running for State Senator of Chicago and losing to incumbent Bobby Rush in 2000. There is some value in the visual juxtaposition of Romney and Obama’s environments, and general comparative patterns do emerge, such as the fact that despite their many differences they have some strange parallels of varying significance. Both men attended Harvard, have faced partisan prejudice, and banked on health care as their legacy issue. The truly fascinating, unexpected takeaway is that the two men share similarities in terms of what drives them: They are confident, ambitious people who, despite having outward charisma, are actually secretive about expressing their personal thoughts, preferring to play the game, rather than share their inner selves after all the disappointment and rejection. Many other big-picture conclusions, however, like the idea that Obama is driven by his sense of identity crisis, Romney by a fear of disappointing his father, feel like a bit of a presumptuous leap to make in just two hours. Frontline might have done better presenting two separate, hour-long shows, one entirely on Obama and one entirely on Romney, then allowing viewers to draw parallels between the two for themselves. At times The Choice is too fixated on its thesis, delving into the history of two complex people only in order to race toward the present day, to confirm that each event in their lives was just step in the ladder of their destiny to be presidential candidates. As a result, the show favors stories that better fit into the larger conceptions it builds for each subject. For example, one of the most fascinating elements of Romney’s story is the fact that he grew up hearing about the suffering of his ancestors, like a grandfather with five wives who began a Mormon colony in Mexico (predominantly to be able to practice polygamy in freedom), but because it was hard to peg this very specific bit of lore to Romney’s character as a presidential hopeful, and there was no corresponding anecdote in Obama’s history to pair it with, the show rushed right through it. Perhaps if the moments of Romney and Obama’s youth and early work had been given more room to breathe, they would have meaning beyond their relevance to the impending elections. This would allow for a deeper and more personal story, and better character analysis. The most troubling issue with the show is its suggestion that this is not merely a psychological assessment, but a crucial tool in deciding how to vote, emphasized in both the title and the conclusion. The wrap boils each candidate down to a few personal attributes as explored over the last two hours and then somberly announces that these are the choices, and “the country must decide between them.” Each candidate’s policy and platform is barely touched on over the course of the show, only mentioned in the context of some personal success or failure. Our perception of the character of a presidential candidate, their sense of duty and justice, will of course be a contributing factor in how we choose to vote. However, policy, platform, and professional record should be far, far more important factors, and the The Choice fails to recognize this in its eagerness to prove its own usefulness.